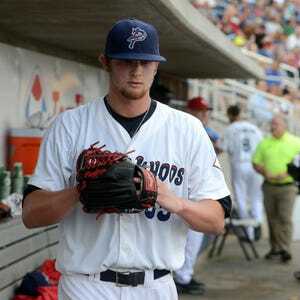 Ben Lively did not begin this season on lists of Top 20 prospects in the Philadelphia Phillies minor-league system. He's catching everyone's attention right now. LIvely, 24, a Gulf Breeze High and UCF graduate, received his second pitcher of the week award Monday in less than a month and in two different leagues. Lively pitched in Pensacola during the second half of the 2014 season with the Blue Wahoos. Now with the Lehigh Valley IronPigs, the Philadelphia Phillies' Triple-A affiliate in Allentown, Pa, Lively was named the International League pitcher of the week. He went 2-0 with an 0.69 earned run average in starts and wins against the Gwinnett (Ga.) Braves, then Saturday night in the IronPigs' 16-1 win against the Durham Bulls. He was promoted to Triple-A on May 27. This latest award follows Lively being named the Eastern League pitcher of the week May 16 when he stood out in Double-A for the Reading (Pa) Fightin' Phils. His combined 10-0 record this season is the best in all of minor league baseball. LIvely, who is in his fourth season in professional baseball, is the first pitcher in any level of minor league baseball to get 10 wins this season. He has a 1.94 ERA. He began the season ranked No. 28 in Baseball America's list of the Phillies' top 30 prospects and rated No. 30 on MLB.com Prospect Watch for the Phillies. "It feels pretty good," said Lively, speaking to MILB.com after Saturday night's win. "Just can't be satisfied with that and keep rolling." Included in Lively's amazing season is the fact he has not lost a game in his last 21 starts, going back to last July. The Phillies, meanwhile, have not needed to travel far to scout Lively's progress. Allentown is 62 miles in one direction from Philadelphia; Reading is 63 miles in a similar direction from the big-league club. In Lively's two starts the past week, he allowed just three hits, had 11 strikeouts and six walks in 13 innings. Lively played for Blue Wahoos manager Pat Kelly in the Cincinnati Reds' Rookie League affiliate (Billings, Mont.) in 2013, then Bakersfield, Calif. In 2014 before joining the Blue Wahoos and making his hometown debut following the Southern League All-Star break that season. The Reds chose him in the fourth round of the 2013 draft. On New Year's Eve 2014, Lively was traded by the Reds to the Phillies in exchange for major-league journeyman outfielder Marlon Byrd, who wound up playing less than five months with the Reds. Last season, Lively spent the entire year with the Reading Fightin' Phils, going 8-7 with a 4.13 ERA in 25 starts. 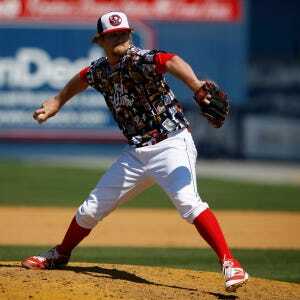 READING (Pa.) FIGHTIN' PHILS (Eastern League) — 9 games, 9 starts, 7-0 record, 53 innings pitched, 35 hits allowed 1 HR, 15 walks, 49 strikeouts, 1.87 earned run average. LEHIGH VALLEY IRONPIGS (International League) — 4 games, 4 starts, 3-0 record, 26 innings pitched, 12 hits allowed, 2 HR, 8 walks, 20 strikeouts, 2.08 ERA.